You know how much I love sweet flavors for breakfast, right? I am sugar free for 5 years – check my post on how to start a low carb diet if you want to learn more. I always found a way to enjoy a delicious sweet low carb breakfast: low carb porridge is my daily favorite! Someday are busy and those low carb granola bars are great breakfast on the go. They are made of a bunch of super food, mainly 10 ingredients that all low carb lovers have in his pantry. 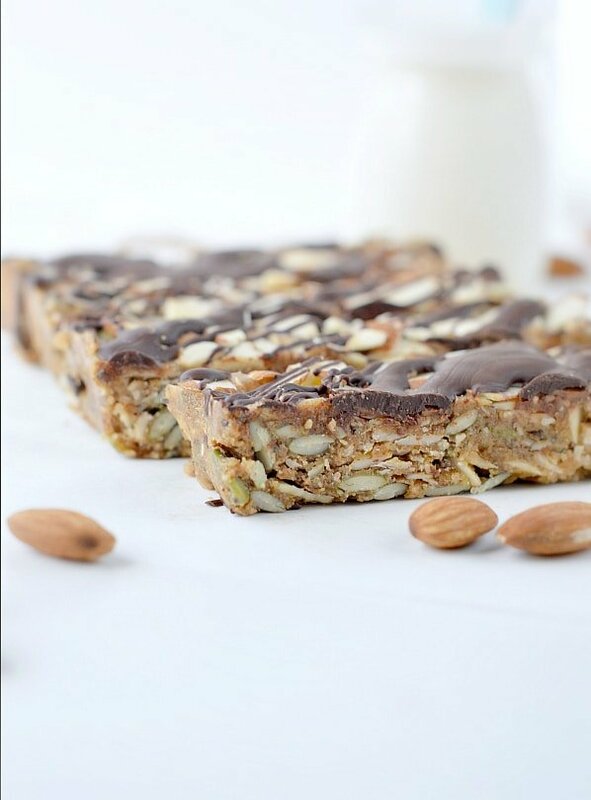 This no bake grain free bar is great make ahead breakfast bar recipe. All you need to make those low carb breakfast bars are 10 simple ingredients and 15 minutes. Almond butter or any nut butter you love like peanut butter or cashew butter. Make sure it is fresh from the jar, smooth and no sugar added. Coconut oil – I love to use unrefined coconut oil because I enjoy coconut flavor. If you don’t use refined coconut oil, it has no coconut flavor. Sugar free dark chocolate chips or either use stevia sweetened dark chocolate or 90% cocoa chocolate if you are ok with some bitter cocoa flavor. I love to freeze my bars 20 minutes to set them quickly but you can also leave the batch 3-4 hours – or overnight – in the fridge, both method works really well. 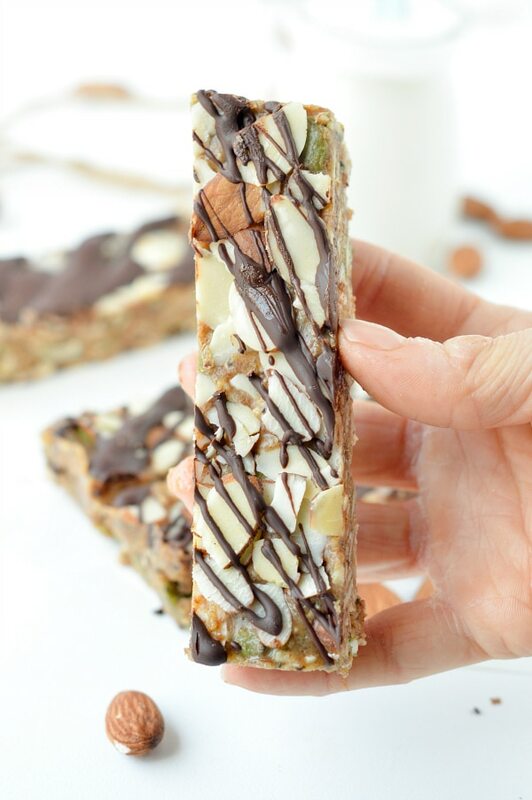 They are easy bars to carry in your bag and eat on the go. 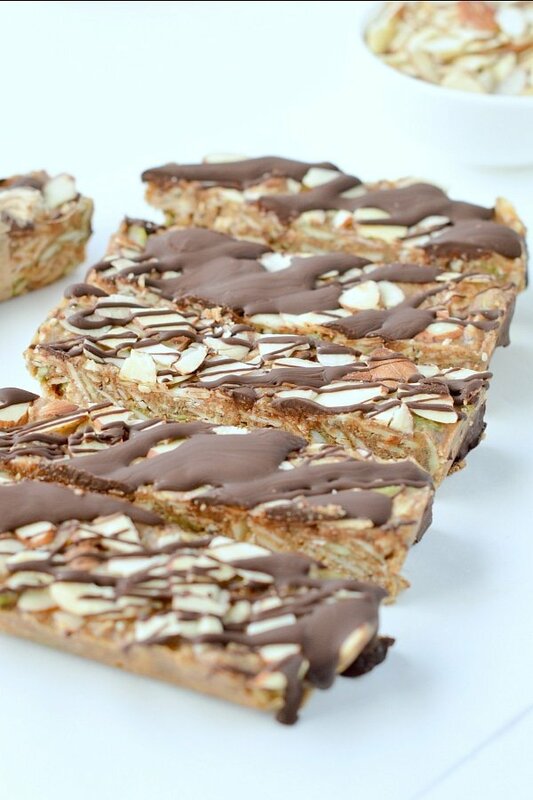 It is a no bake recipe so the bars tend to soften if they stay too long out of the fridge – specially on hot summer. I usually wrap mine in plastic wrap to make sure they stay fresh until I eat them. 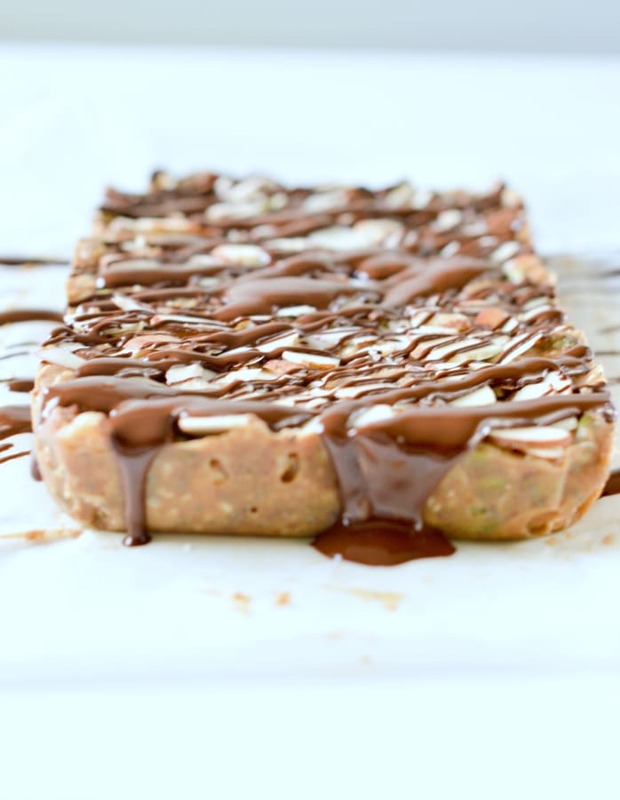 Each bar is packed with nuts, seeds and creamy nut butter. The texture is crunchy and soft. It is not a chewy bar has there is no liquid sweetener involved but it is a delicious melt-in-your mouth bar with crunchy pieces of nuts and seeds to keep you full until lunchtime. 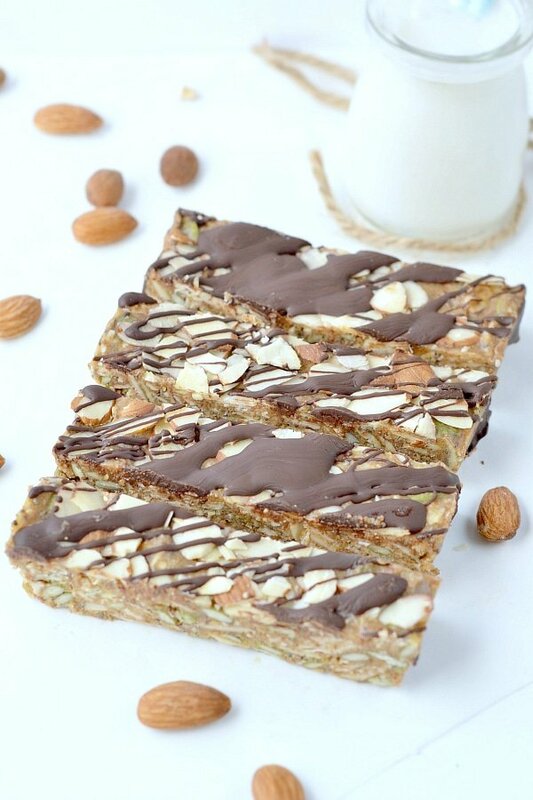 Watch the low carb breakfast bars recipe and make them now! 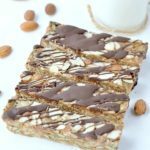 Low carb granola bars easy clean eating keto bars, NO baking ! Creamy almond butter, flaxseed meal, chia seeds, almonds, coconut and more! 100% Sugar free, gluten free paleo breakfast or snacks. In a medium mixing bowl or a saucepan, place all the wet ingredients: peanut butter, coconut oil and vanilla. Microwave by 30 seconds burst, stir and repeat until the coconut oil is fully melted and combine with the nut butter. It should not take more than 1 minute 30 seconds. Otherwise, melt the ingredients in a saucepan under medium heat, stirring often to avoid the mixture to stick to the pan. Stir in the sugar free crystal sweetener, stir and microwave an extra 30 seconds to incorporate well. Erythritol don't dissolve very well but it will give some delicious sweet crunch into your bars or see paleo note. In a large mixing bowl, add all the rest of the dry ingredients: sliced almonds, flaxseed meal, chia seeds, pumpkin seeds, shredded coconut and cinnamon. Stir to combine. Pour the nut butter mixture onto the dry ingredients. Stir with a spatula to combine. 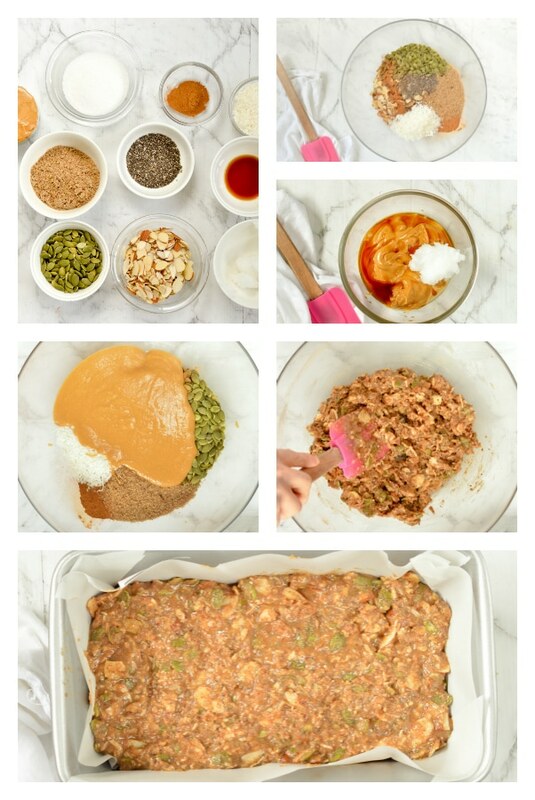 You want to cover all the dry ingredients with the nut butter mixture. Transfer the mixture into the prepared loaf pan. Press evenly the mixture with your hand to leave no air. Flatten the surface with a spatula. Freeze for 20 minutes until the breakfast bars are hard and set. Remove from the freezer, lift the parchment paper to pull out the bar from the loaf pan. Place on a plate. Sprinkle extra sliced almonds on top. In a small bowl, microwave the sugar free dark chocolate and coconut oil until fully melted. Drizzle the melted chocolate on top of the bar, return into the freezer 1-3 minutes until the chocolate is set. Cut into 8 breakfast bars. Wrap each bars individually into plastic wrap or bee wax. Store in the fridge up to 8 days. Sugar free Sweetener: this recipe is 100% sugar and use sugar free crystal sweetener. I recommend erythritol or monk fruit sugar. Both are zero carbs, zero sugar and natural. Note that sugar free crystal sweetener don't dissolve very well in no bake goods and it is ok. It adds some delicious crunchy sweetness in the bars. Paleo sweetener: unrefined sugar I recommend is coconut sugar. Merci beaucoup! I am in France, I bought cups to make your lovely recipes that I am sad are not shared in grams. But those bars are absolutely delicious! I won’t buy any from the supermarket from now on. Thanks Carine. A bientot. Oh thank you ! you made my day 🙂 So glad you enjoy the bars and happy to have more French people reading me too. Bises de Nouvelle Zealande. Carine. I love Monk fruit sugar too! Ithanks for lovely feedback. XOXO Carine. I just made these and they are delicious! It was so easy too! I can’t eat chocolate, so I skipped the drizzle. My 3 year old loved them too. Thanks for the great recipe! I am so happy to read your beautiful comment! My kids are big fans of those bars too. Enjoy the bars and all the recipe on the blog. XOXO Carine. These are delicious and so easy…but they melt so fast in my hot, little hands! 😉 Thanks for the recipe! It must be really hot where you live if they melt 🙂 But I agree, they are getting softer when out of the fridge for a bit but it is winter here in New Zealand so it is ok, will test them in summer soon ! Thanks for reading the blog and for your lovely comment. Enjoy the recipes around here! XOXO Carine. I made these today in the summer in America, and they did not melt! This is good. They are delicios. Thanks for sharing your redipe with the world! I am enjoying reading your blog. Yeah! I am so happy to hear that ! Thanks so much for trying my recipes. Enjoy the blog. I am so glad you find me, XOOX Carine. These look amazing but I can’t have coconut oil, do you think it can be replaced with something else? Hello my friend! Coconut oil is very important in this recipe because coconut oil harden <23C. So it is what make the bars hold together, harden in the freezer. If you use butter or any other oil it will be uper soft and never hold as a bar. I am SO sorry ! I wish you could find coconut oil at some stage cause this recipe is so easy and good! Thanks for reading the blog, XOXO Carine. I made them with melted cocoa butter instead of coconut oil and they hardened up and stuck together very well! So yummy! I’ve made these 4 times now. Yum!I love cocoa butter as well it must taste like white chocolate! I will give it a go next time I make my bars. Thanks so much for sharing your idea, I love trying new things. Enjoy the blog recipes. XOXO Carine. Kia Ora Daphne! So nice to have more Kiwi on this little blog. I am so happy you find me and you enjoyed this recipe. You will find lts of lowcarb keto friendly recipe on my place, specially sweet as I am a sweet tooth. Enjoy them! Bye from Auckland, XOXO Carine. I am so happy to read your beautiful comment about those bar! Enjoy the recipes on the blog Chris. Talk to you soon. XOXO Carine. Made them and fell in love !! They are amazing !! Brought some to work to share.. My coworkers love them too.. thank you for the recipe!! That is wht I love to read in the morning! Happy comment makes my day better. Thanks so much for trying those granola bar recipe and sharing with your colleague too! Think about taking me on instagram with your lovely creation that everyone can see it too! I love to see what you made. Have a lovely time on the blog and thanks again for being here! XOXO Carine. All of your food is so pretty. You are an artist with food. Thanks Stacey! Beautiful and I hope delicious too! Enjoy the blog recipes. XOXO Carine. Yeah! I am so happy to have some New Zealand readers on this little blog! And this is the comment I love to read in the morning. It makes me so happy to know how much you love those bars too. Enjoy all the low carb recipes on the blog. XOXO Carine. Thank you so much for this lovely comment. I am really happy that you love them. Enjoy the blog recipes. XOXO Carine. Do you have the exact nutritional value for these? Yes sure, scroll down after the recipe box to see the full nutrition panel and breakdown. Enjoy the recipe and all the healthy recipes on the blog. XOXO Carine. Yes of course. If you intend to store them for a while – few weeks, I recommend to store the in Ziploc bag. Defrost an hour before eating. Enjoy the recipe and all the healthy treats on the blog. XOXO Carine. Hello! I am so happy to have more NZ based people on my blog! We can’t find swerve in NZ. However, we have great sugar free crystal sweetener that you can shop in the baking aisle of Countdown or Pak n save (I shop all my ingredients from them!). I recommend Natvia as a sugar free crystal sweetener (australian brand). They also make sugar free icing sugar, cocoa powder and Nutvia – a sugar free chocolate spread 99% sugar free with no palm oil. It is natural, low carb and low calories. For chocolate, you have got different options. If you are new to sugar free, using 85% cocoa chocolate is a good start, I love Lindt. If I want 100% sugar free I buy the chocolate bits from Healtheries – often sold in the organic aisle of supermarket. It exist in milk or dark chocolate flavors. Finally, sugar free chocolate bars I snack on are from Well Naturally ( my favorite as it sweetened with stevia, no maltitol – the previous brand use maltitol and it upset my stomach if eat too much). If you follow me on instagram, I often show what I eat in my live story. 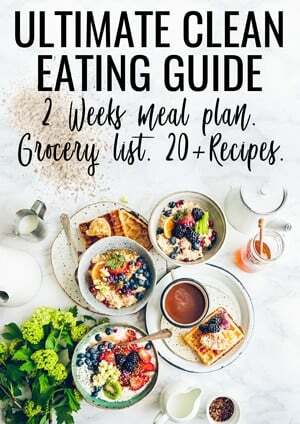 I hope this help you start your low carb diet easily ! Have a lovely time on the blog. XOXO Carine. These are yummy. I modified ’em slightly by adding cocoa powder to the nut butter and an extra squirt of chocolate flavored Stevia. So good. I’m an American currently living in Italy, and they melt for me, too, so I’ll keep ’em in the freezer until I’m ready to eat one. Of course, no central heat or air here, so the house is usually pretty warm except for rooms I turn on an air conditioner in. Thanks again! Quick and easy! Thanks for this lovely comment! I am so glad you love the bars. Enjoy the blog recipes from Italy, XOXO Carine. When I was cutting them they broke in pieces but still I am happy with the recipe. The chocolate drizzle on top really help the bar to hold together or maybe wait 10 minutes after they have been freeze to cut them. They will be softer and easier to cut. Enjoy the recipes on the blog and thanks for trying them. XOXO Carine. Second time making these, they are so good and easy to make! Love them! I am so glad you love the bars too! Thanks so much for making my recipe and sharing your nice feedback here. Really appreciated. Enjoy the blog recipes. XOXO Carine. Hi, I loved your bars. They were delicious. I started to cut down my carbs to lose weight for my son’s wedding. I lost 6 pounds. I was just wondering if 300 calories was too much for breakfast? Or the calories don’t matter. Or is this something you can eat after you have lost the weight you want to lose. Help! On low carb I don’t watch my calories but my macro, making sure that my fat, protein and carbs re within the boundaries. This said 300 calories for a breakfast is totally acceptable, it is what most regular breakfast calls for except here you have lots of fibre to keep you full for longer ! Well down on the weight lose and happy wedding to your son ! XOXO Carine. Hi I’m from Napier NZ!!! Just wondering what brand of sweetener do you use? Also what do you use as a replacement for powdered sweetener????? This looks amazing and will be making them this week! Im from South Africa 🙂 I’m loving the flavour of the bars!!! I used xylotil as my sweetener but when I cut my bars they crumbled, any idea as how I could improve? Hi Anna, I would leave them only 20 minutes in the freezer, they need to be cold to solidify enough to harden but if you over freeze it will be hard to cut as it will form a rock of nuts and nut butter. Another tip, warm the knife blade on the stove flame, the knife will go through the bar easily, melting the nut butter and coconut oil as you push the blade through without adding too much pressure on the whole bunch. It should avoid the bar to crumble hopefully. Thanks for trying my recipes, Have a lovely day, XOXO, Carine. Hi, what is the fat content of this recipe please. Scroll down after the recipe box for the full nutrition panel. Thanks enjoy the recipe. XOXO Carine. Wondering whether you can substitute honey instead of the sugar substitute? This recipe sounds so good….can’t wait to try it! Of course any liquid sweetener will work very well in this recipe. Enjoy the bars. XOXO Carine. Hi, thanks for sharing the recipe, I was wondering if O could avoid using any sweetener. Yes sure you can ! I should not impact the whole recipe texture. It will simply be no sweet at all. Enjoy the lovely granola bars and all the low carb sugar free recipes on the blog. XOXO Carine. What would be the best way to add more protein to these do that I could use them as a meal substitute? I need between 10 -30 grams. Thank you. You can usually replace almond meal by oat flour with a 1:1 ratio but it won’t be low carb anymore. You can add hemp powder for the extra powder but it will dry out the recipe. Enjoy ! XOXO Carine. These are the best! A little soft at room temperature, but I serve them frozen. I love the idea of eating those frozen! So cool ! XOXO Carine. These are SO SO SOOOOO DELISH! Thank you for sharing!!! Thank YOU for this amazing feedback. I am so happy that you love the granola bars as much as I do. Enjoy all the recipes on the blog. XOXO Carine. I am sorry to hear that ! I will try to convert more and more recipes in grams but I like to share the unit I test in my own kitchen for precision. You can find cups for cheap on amazon it is really helpful ! Enjoy the blog recipes. XOXO Carine. Hello from Vancouver, Canada. These have a delicious flavor. I have made them with pecans and with almonds and both are great. I use Lakanto monkfruit sweetener and Lily’s chocolate chips. Thank you for your recipes. Do you think these will hold up ok for a school lunch snack? Worried they might be melted before the kids can get to them. In summer they melt fast but in winter it is fine ! Enjoy the low carb recipes on the blog. XOXO Carine. Any coconut oil brand will work, yes, refined or unrefined. Enjoy the bars, XOXO Carine. Hi Carine, I am on East Coast USA near DC. I’ve made these three times now they are so filling and good. First batch I cut into 8 I had one then left for work when I got home my husband had eaten three! Anyway mine seem to fall apart and melt easy. I tried using a little less coconut oil and more flaxseed meal but it made them even more crumbly. I’m wondering if it’s the almond butter, I could only find the organic and of course when you open it the oil is sitting on the top and you have to mix it in. Do you have any suggestions? Hello from NZ Sue! Do you mean they fall apart when you cut them? If so, it can happen because they get very hard after they come out of the freezer. Warm the knife blade under a your cooktop flame. The knife will smoothly come through the bars not breaking it at all. Also, store them in the fridge to keep them harder. It is cold here in New Zealand so I don’t have this problem as much 🙂 Last tip, try to use peanut butter or cashew butter or sunflower seed butter. I agree that almond butter always have oil sitting on top and make it more difficult to measure. Enjoy the low carb recipes on the blog Sue, XOXO Carine. Hi. I love these bars, but I have a question. I bought Whole Earth stevia and monk fruit zero calorie sweetener. Carb ManGer says it has zero carbs in 1/3 cup, which is required in the recipe. My concern is that on the jar, it says HALF a TEASPOON has 2 grams of carbs. Am I using the correct product? Thanks. I am not familiar with this product brand but usually a stevia Monk fruit blend has no carbs. You should contact the manufacturer if you are not sure about their nutrition panel. Enjoy the recipe, XOXO Carine.